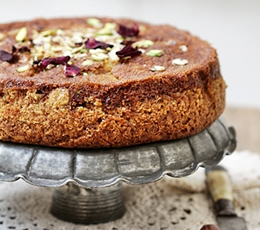 “An addictive, warm, spicy Armenian cake with pleasing overtones of nutmeg and walnut.” If Deeba’s description of this doesn’t make you want it, nothing will! Thanks to Deeba from passionateaboutbaking.com for this simple baking recipe. Preheat the oven to 350F. Lightly grease an 8″ springform tin (or line). She used a dessert ring and lined it with foil. Mix the baking soda into the milk and set it aside. Add the brown sugar and pulse a couple of times to mix. Divide this into half. Press half into an 8″ springform tin, pushing up some into the sides if you like. Else pat firmly to create a base. In the bowl of the processor, add the milk-baking soda mixture to the remaining biscuit mix with the egg and freshly grated nutmeg, and process for 2-3 minutes till you have a smooth batter. Pour this batter over the pressed crust, and sprinkle ¼ of your walnuts on top. They will sink into the rather ‘liquidy’ batter. Toss the remaining walnuts in a tsp of flour, and sprinkle on top gently. Cool the cake in the tin before demolding. It is best eaten while still warm, though it’s enjoyed cold too.